An exclusive and show stopping Dog Collar! the Design inspiration for the Madison Avenue Dog Collar with matching Madison Avenue Dog Lead is taken from the world renowned stores of Madison Avenue New York. Woof New York created the Madison Avenue Dog Collar from a one of a kind crackled glazed White & Gold Italian leather which is perfectly set with solid brass hardware. Designed and handmade in New York by local leather craftsmen the hand picked fine Italian leathers have been hand dyed and chosen for a small capsule boutique collection by fashion designer . Woof New York is followed by true fashionistas of style on both sides of the Pond favoured with toy to medium sized dog owners this is truly a designer dog collar collection. The custom embossed leather has hand painted edges and exclusive to the house of Woof New York. This luxury collection of Madison Avenue Dog Collar and matching dog lead really sets your four legged friend apart from the trend setting pack. 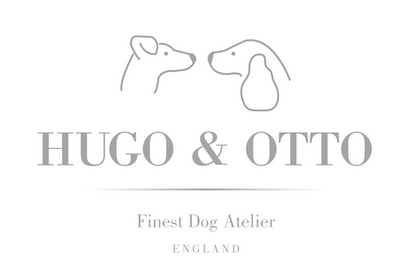 Hugo & Otto were blessed with an exclusive collection into England and Europe to offer you the very best in handmade designer Dog Collars and accessories from around the globe.